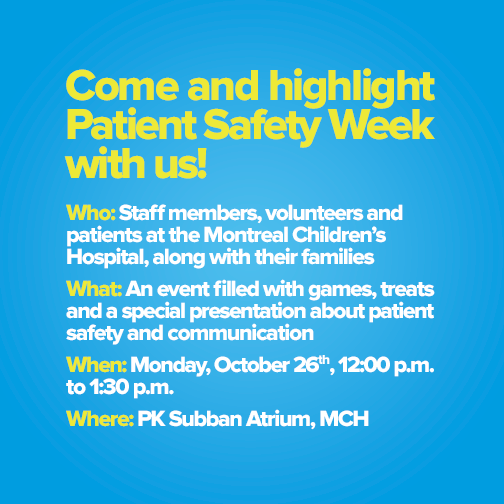 Come and highlight Patient Safety Week with us! Whether you’re a Montreal Children’s Hospital staff member, patient or family member, everyone’s role is important when it comes to communicating concerns as they relate to patient care. Effective and open communication is truly a two way street and requires all of us, regardless of our roles to speak up when something doesn’t quite seem right, and in turn, listen when someone raises a potential issue when it comes to the care of patients. The “We should talk” campaign aims to encourage speaking up when there is a safety concern, and to develop a collaborative approach when concerns are raised. This campaign targets patients and families and everyone involved in their care. By creating a campaign that addresses a very serious issue in a modern, funny, and impactful manner, we hope to inspire both patients and families and all staff members involved in their care to effectively communicate to eliminate preventable harm. Children’s health is our priority at the Children’s, which means we are dedicated to providing care that is safe and optimal for each patient. Whether it’s a question about why a particular medication is being given to a patient or raising a concern about a treatment that’s been prescribed, we want you to ask, and we are here to listen. After all, patient and family-centred care is at the heart of our values. Questions and concerns about the care we provide are key to ensuring that we raise issues that may present harm to any of our patients and that we discuss them openly. The We should talk campaign aims to inspire each of us to speak up when a variety of situations arise, and in turn, empowering each and every one of us to listen when such a question or concern is voiced.